Sterling silver bead for the throat chakra. 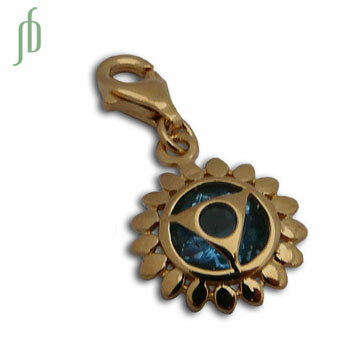 The throat chakra, or vishudda, is for communication, honesty and integrity. The bead has about a 4.5 mm hole with rubber stopper (can be removed) and the charm symbol for the throat chakra hangs down. Communication. Honesty. Integrity. Gold vermeil Throat Chakra Vishudda Earrings with turquoise stone. Also available in silver.